Join us for a Civic Dinners conversation exploring how we understand race and how we can bridge the racial divide to build Dr. King's dream of the Beloved Community. The King Center invites you to join leaders across the world in a conversation exploring how we understand race and how we can bridge the racial divide to build Dr. King's dream of the Beloved Community. In honor of the 50th Anniversary of Dr. MLK Jr.'s assassination, The King Center invites people of different racial and ethnic backgrounds to come together over dinner and share stories and experiences around race. By sharing stories we can begin to understand one another, our personal struggles and our collective struggles, and together commit to bridging the racial divide in America, and beyond. Gather 6-10 friends, peers, colleagues and neighbors for dinner for a conversation exploring how we understand race and how we can bridge the racial divide in your community. Go to civicdinners.com/theracialdivide and click “Host a Dinner” to setup your dinner. YOU are amazing! Thank you for diving in and being 1 of 1000 Civic Dinner hosts for Bridging the Racial Divide! We've created copy/paste messaging to help recruit attendees at your dinner. I'm hosting a Civic Dinner on Bridging the Racial Divide on [insert date and time] at [awesome location of your Civic Dinner] and would love it if you could make it! This isn't just any dinner. This conversation is one of hundreds happening across the U.S and beyond as part of The King Center's Beloved Community Talks series. It's all about bringing people of different racial and ethnic backgrounds together to share stories and experiences around race. The hope is to gain a greater understanding of one another, our personal struggles and our collective struggles as it relates to race. You can anticipate some good food and good company, and some really meaningful and important conversation around how we can bridge the racial divide in our community, in America, and beyond. I think talking about race among family, friends, and colleagues will bring clarity and hopefully some solutions we can forward on to those ready to help. I'm hosting a Civic Dinner on behalf of [TAG @TheKingCenter]! Join me [insert date and time] for a night of meaningful and important conversations exploring race and how we can bridge the racial divide. [TAG @thekingcenter] is looking for leaders across the world to host a Civic Dinner on Bridging the Racial Divide. You'll join a movement of thousands of conversations happening starting in April as part of a celebration honoring the 50th anniversary of The King Center and Dr. MLK Jr. I'm hosting a Civic Dinner as part of 1000 dinner conversations across the nation starting in April! Join me [insert date and time] for a night of meaningful and important conversations around how we can bridge the racial divide. 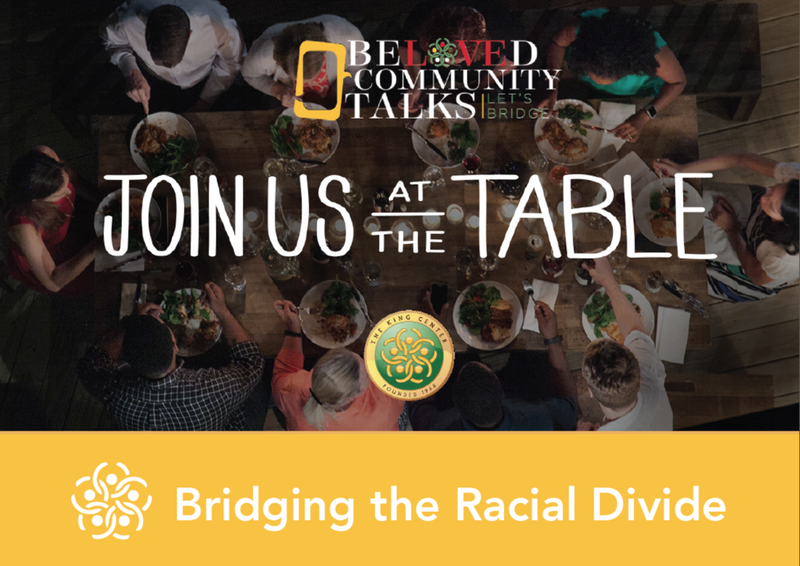 Join us at the table for a conversation exploring how we understand race and how we can bridge the racial divide to build the Beloved Community. This conversation aims to bring people of different racial backgrounds together to share stories and experiences around race. By sharing stories we can begin to understand one another, our personal struggles and our collective struggles, and together commit to bridging the racial divide in America, and beyond. You’re invited to join communities across America in a conversation exploring how we understand race and how we can bridge the racial divide to build the Beloved Community. For the next year, over one thousand Civic Dinners will take place across America with the aim to bring people of different racial backgrounds together to share stories and experiences around race. By sharing stories we can begin to understand one another, our personal struggles and our collective struggles, and together commit to bridging the racial divide in America, and beyond. We are proud to partner with The King Center for this important conversation and see it as a great way to engage our local partners, families and community leaders.